I crocheted this blanket for my grandson. When I saw the pattern I was very interested in making the blanket. It looked almost knitted, but it was crocheted! I had to do it. I used Caron Simply Soft yarn. I use this a lot for baby blankets, because it is soft yet durable. It can go easily in the washer and dryer. A must, if you ask me, for a baby or toddler blanket. 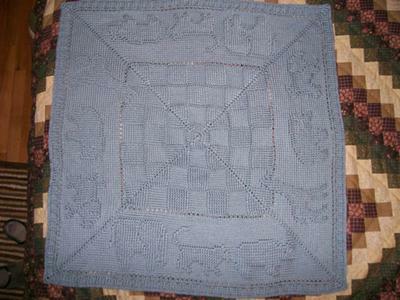 I got the pattern from the booklet: Leisure Arts #4439, A Year of Baby Afghans, Book 4. 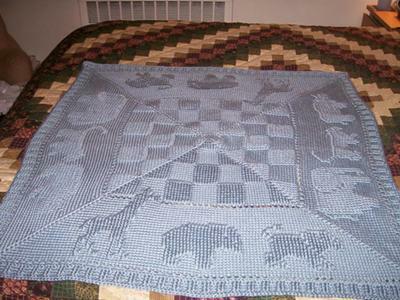 The afghan is the August pattern. The pattern was easy, but the way it was written in the book made it hard to keep track of where I was once I got to the animal section. For this reason, I created a spreadsheet from the written words that showed the type of stitch and the number of stitches for each round in the animal section of the blanket. Once I had my "chart" I was able to keep track of where I was with no problem. This is one of my favorite all time blankets. Hi, I'm making this same blanket now and I know what ou mean about the animals - not to mention you're crocheting them upside down! I am getting so confused. Can you please elaborate on the chart you made. I am familiar with filet crochet charts, but I can't figure out how to chart the Animals. Help! This blanket is absolutely gorgeous.